Citroën C1 is eye-catching with eight body colours and LED daytime-running lights - a clear sign it's part of the new Citroën family. The vertical lights create an upbeat, hi-tech light signature that showcases the car's sassy style and innovative character. PLAY WITH CONTRASTS AND DARING COLOURS! Citroën C1 has no less than eight available body colours including Blue Lagoon and Lipizzan White. 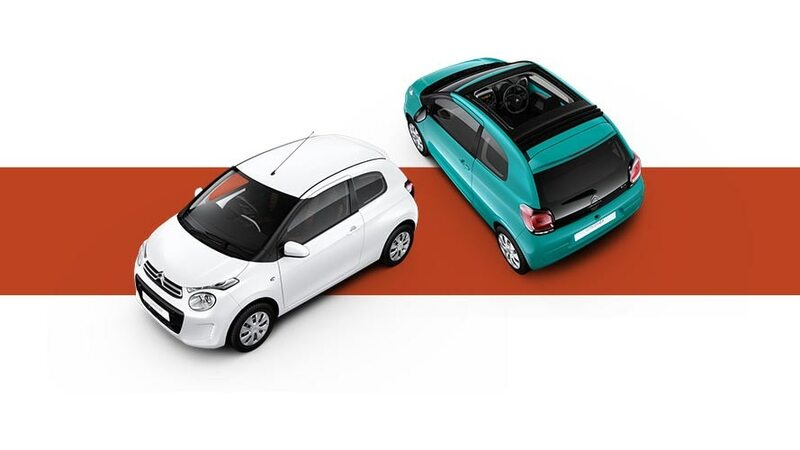 Citroën C1 is also available with bi-tone roof colours optional on Feel and Flair versions. Citroën C1 is a car of bright, original styling, with its dynamic lines and cheeky gaze. The strong styling is underlined by the visual continuity between the windscreen and side windows, with chrome-finish weatherstrips, depending on trim. As a final touch of modern, urban chic, it is available with 15’‘ alloy wheels. Designed to make everyday life easier. The functional 780 litres boot is easy to access, with the parcel shelf lifting out of the way when the tailgate is opened. The Citroën C1 delivers an enjoyable driving experience on all types of road, with excellent suspension and comfort whatever the circumstances. Six airbags as standard, (front, side, curtain) and an ESP system that keeps it on course if it loses grip. The speed limiter and tyre pressure monitor also contribute to a relaxing driving experience. Pptional Active City Brake, a feature that automatically starts braking when you get too close to the car in front and a Lane Departure Warning system that alerts you in case you stray over the road lines.